New for 2011, Wilfried Schmidt has made dynamo lighting more convenient and reliable than ever. Until now, you have had to manually disconnect wires from the hub dynamo before removing the wheel, and then reconnect those wires when reinstalling the wheel. Late at night on a 600k brevet or while riding home from work in the rain or snow, it can be a bit awkward to reconnect wires with cold fingers after fixing a flat tire. The Schmidt SL hub axle eliminates the need to connect and disconnect wires when mounting and dismounting your dynamo wheel. 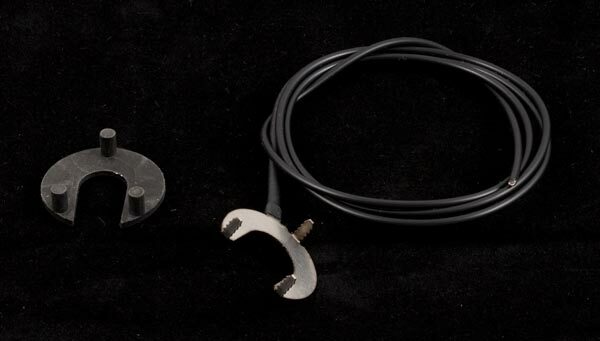 Designed to be used with a specially made fork, the hub makes the electrical connection directly through the fork dropouts. Once you clamp the skewer tight, just get back on the bike and ride. Your lights will be working perfectly. The right side axle end isolates the surface that faces the dropout from the axle center. The axle itself carries the ground side of the electrical circuit. The dropout face on the right side of the hub carries the power side of the circuit. You can easily tell the difference between the right and left side by looking at the axle end cap. The right side cap is wider than the left side cap. The right side cap must only be inserted in the fork on the right side of the bike. With the disc version of the hub, the disc is always on the left so there's never a chance of mounting the hub backwards. Also, the printing on the hub flange is only on the right side of the hub shell. In the dark, you can feel the printing on the right side of the hub, so you know which way to install your wheel. At night without lights, if you mount the wheel backwards in the fork you get a short circuit and your lights will not work. Simply reverse the wheel and all is well, no harm done to either lights or hub. Even riding at high speed on long descents with the wheel backwards will caue no damage. There would only be increased drag due to shorting the output of the hub, but that drag would still be less than if you were using a sidewall dynamo. If you use a quick release, and have the lever on the left side of the bike, you'll always align the wheel correctly. If you mount your disc wheel backwards, I offer remedial cycling courses on Wednesday nights. Bring your own cigars, cognac and witty repartee. The Schmidt SL hub won't work as a dynamo on standard forks. Your fork must be specially made. The inside surface of the right side dropout carries the power side of the circuit. Some older forks can be modified by a frame builder. If you're having a frame builder make you a new frame, have the builder contact us for details on building a fork that's compatible with the SL hub. An SL compatible fork can be used with any normal hub, whether it is a dynamo or not. But an SL hub cannot be used in a standard fork if you want to use its power output. See below for frame builders who are building SL forks. SL hubs for quick release can be used with any 5mm skewer. Unlike other Schmidt hubs, the SL hubs do not come with a skewer. 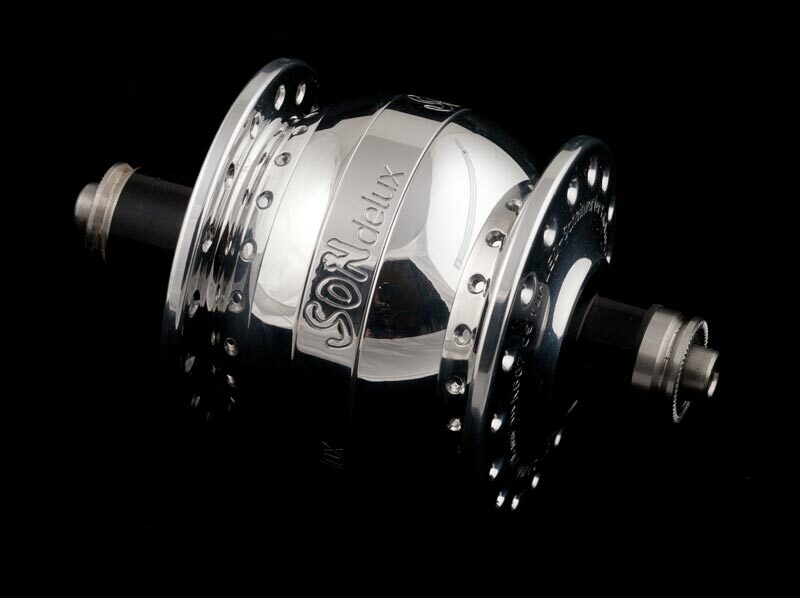 SONdelux SL hubs are available red anodized, both Centerlock disc and without disc mounts. However, the SON28 SL is available red anodized only in the ISO (six bolt) disc version. The red anodizing is done by the same company that does the red anodizing of Rohloff hubs, so these are a perfect color match with Rohloff, and of course they match the red Edelux headlight. The Rohloff hub's surface has a slightly different texture, so the surface looks a bit different, even though the color is the same. For 2017, we now have SON SL dynamo hubs for thru-axle forks with SL dropouts. I stock forks from Schmidt with the necessary features. They are sized for 26" 559 wheels. One model has studs for cantilever brakes, and the other has disc brake mounts. Both forks are aluminum and painted black. They have a 1 1/8" threadless steerer, the most common type on modern bikes. If you use a different wheel size or use another type of brake, you will need to contact a frame builder and have a fork built to work with the Schmidt SL or SL Disc hub. I stock the necessary dropouts, connections and tools which will make it easy for any frame builder to build a suitable fork, as well as parts and tools to modify existing steel forks. Pictured below is the Schmidt fork for cantilever brakes. Notice the wire at the fork crown. That's the power side of the electrical circuit. The stainless steel washer at the crown is the base for the headlight's mounting bracket. You need to use a stainless steel bracket that will conduct the ground side of the circuit to the base of the headlight. The Schmidt Edelux and E6 headlights conduct ground through their mounting base. Here's a close-up photo of the right dropout. This is really the key to the whole system. There is a stainless steel plate on the inside surface of the dropout, and it is insulated from the rest of the fork. You can see the wire that carries the power side current to the headlight. It runs through the right fork blade. In the upper photo, you can see the wire at the fork crown. The fork measures 383mm from the hub axle to the bottom of the crown, and 420mm from the hub axle to the crown race. 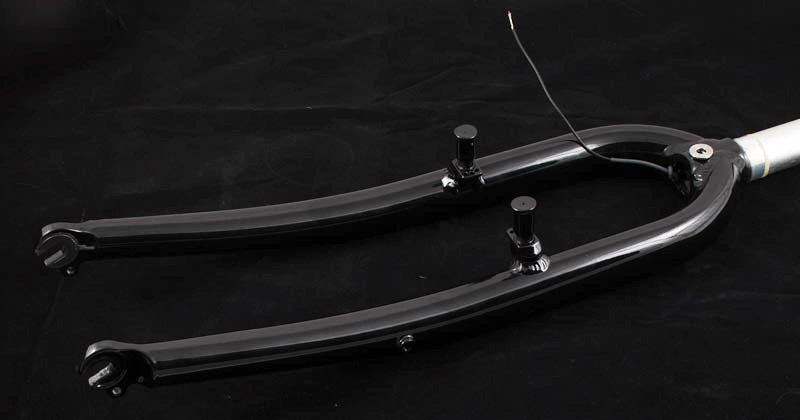 It is suitable for frames designed to accommodate suspension forks. Schmidt 26" (559) aluminum fork for SL Disc hub, disc brake mounts, mid fork rack eyelets, 1 1/8 threadless steerer, painted Black, Part Number, SCH73201, Price: $ 273.00In Stock. If your bike uses side pull caliper brakes, or any wheel size other than the 26" 559, or you want a lugged steel fork, or anything other than the Schmidt 26" SL forks shown above, you'll need to have a fork built to use the SL or SL Disc hub. I stock several types of special dropouts your frame builder will need for a steel fork. And you frame builders, keep in mind: The prices here are retail. I have wholesale pricing for professional frame builders. Unless otherwise noted, these dropouts put the contact plate on the right dropout, so the wire will run up inside the right fork blade. We do have one version for left side contact plate and wiring. See below. And, please think before you build the fork! Remember when building the fork, that the fork itself becomes a part of the electrical circuit. You must be sure that both sides of the circuit have good continuity; not just when you deliver the fork to your customer, but several years down the road as well. Let's say the headlight will be mounted at the fork crown, using a stainless steel mount. A steel fork with a steel crown will provide good continuity when the fork is new. But after a while, oxidation will build up at the crown, and oxidized steel doesn't conduct electricity very well. Perhaps your customer will be mounting the headlight on the side of a steel front rack. Then the rack also becomes a part of the electrical circuit. And the little eyelets that you carefully brazed into the fork blades also become a part of the circuit. Steel eyelets will also oxidize in time. So your customer may find that the lights no longer work. The solution is to use stainless steel eyelets for rack mounting, or the stainless steel cone plate at the fork crown. When silver soldered to the steel fork, these will ensure continuity many years down the road. As of 2018, we've been selling SL hubs for several years now, and we occasionally get a call from a customer who's lights have stopped working. When we go though our troubleshooting procedure, we usually find that the fork builder did not follow my explicit directions in the paragraph above, and has built the fork with regular steel connection points for the grounding of the headlight or taillight, when he should have used stainless steel, per my instructions! 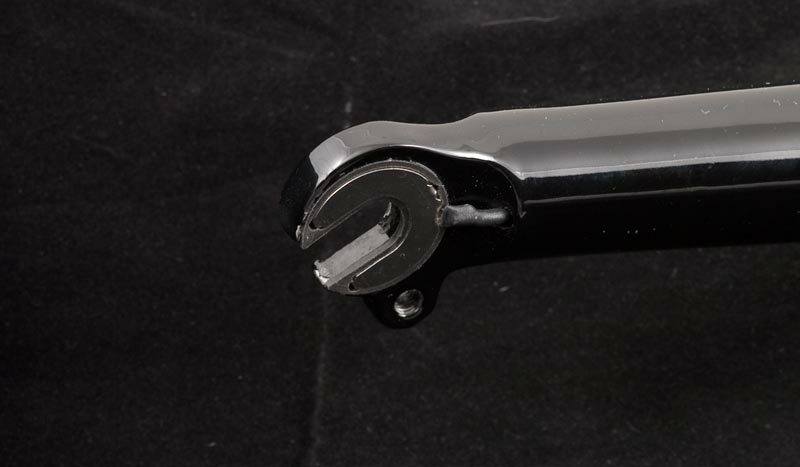 Oaks Manufacturing is making 5x.8mm threaded eyelets from stainless steel, so you can mount a stainless steel or chrome plated rack to the fork and have electrical continuity for many years. Please do not use plain steel eyelets if you are depending on the rack for the ground connection to the headlight. These have a slot at 45 degrees to the fork blade. And we have contact plates made with the electrical connection tab at 45 degrees as well. The right dropout is pictured here on the left. Use the 45 degree rear facing contact plate with these dropouts. Being stainless, there's no need for a stainless ground plate on the left dropout. 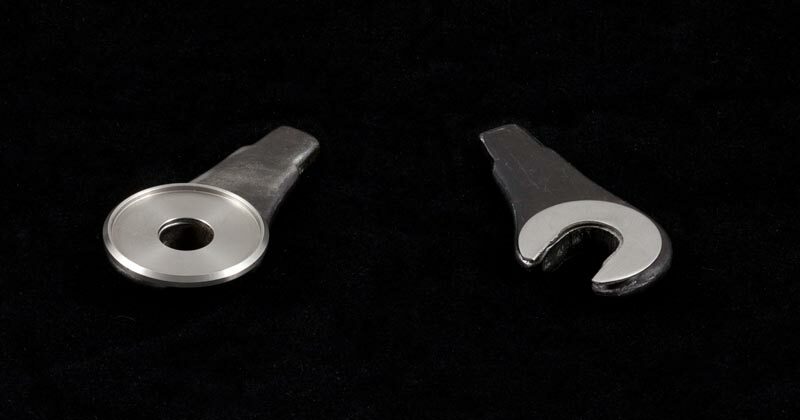 These mild steel dropouts are intended for the builder of traditional style forks. These forks have crowns that are narrower than the 100mm dropout spacing, so the blades aren't parallel, and the dropouts need to be at an angle to the blades. With 4mm thick tabs, these are much easier to align after brazing. You'll need to silver solder a stainless steel ground plate to the left dropout to ensure good conductivity. For the builder who prefers to have the wire run up the left fork blade, which can make for a cleaner installation of the headlight on the left side of a custom front rack, since the wire from the contact plate doesn't need to run across the fork crown. These are not for use on a fork with disc brakes! These mild steel dropouts are intended for the builder of traditional style forks. These forks have crowns that are narrower than the 100mm dropout spacing, so the blades aren't parallel, and the dropouts need to be at an angle to the blades. With 4mm thick tabs, these are much easier to align after brazing. You'll need to silver solder a stainless steel ground plate to the right dropout to ensure good conductivity. The right dropout is pictured on the left. On the right, you see the outside surface of the left dropout, showing the lawyer lips. Mild steel version tabs are 4mm wide making them easier to align in forks with traditional narrow crowns. You'll need to silver solder a stainless steel ground plate to the left dropout to ensure good conductivity. Here the right dropout is shown with the insulating plate and contact plate before they've been pressed together. That wouldn't be done until after the dropout is brazed or welded to the fork blade. These plug type stainless steel dropouts have a 30 degree slot. This is the same shape as in the Schmidt SL fork. They fit a fork blade with 17mm ID. Use with the 30 degree rear facing contact plate. We now have forward facing dropouts from Tout Terrain. These are the same dropouts Tout Terrain uses on their "Blade" forks. They use the same insulator as the Schmidt dropout shown on the right, but then use a reversed contact plate. From left to right, 13.6mm, 11.5mm, and 10.7mm. 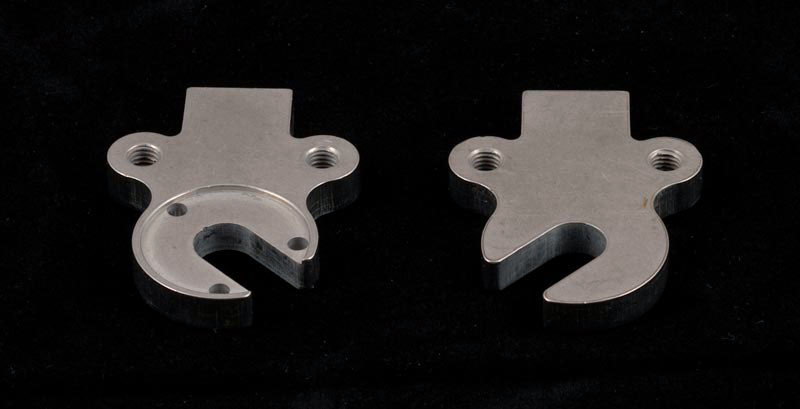 For each pair, the left dropout shows the retaining ring (lawyer lips) and the right shows the holes for inserting the insulator plate and contact plate. The builder could grind off the retaining ring if desired. Here is the set of contact parts for the straight dropouts. After brazing the dropouts, painting the fork and routing the wire, just press in the parts and you're done. From left to right, all of the available (February, 2013) contact plates: forward facing 45 degree, forward facing 30 degree, straight, rear facing 30 degree, and rear facing 45 degree. Notice that there's a forward facing 45 degree contact plate, but no forward facing 45 degree SL dropouts. We make this for custom builders who want the contact plate on the left dropout. Shimano road dropouts have a 45 degree slot and I'm guessing others are similar. 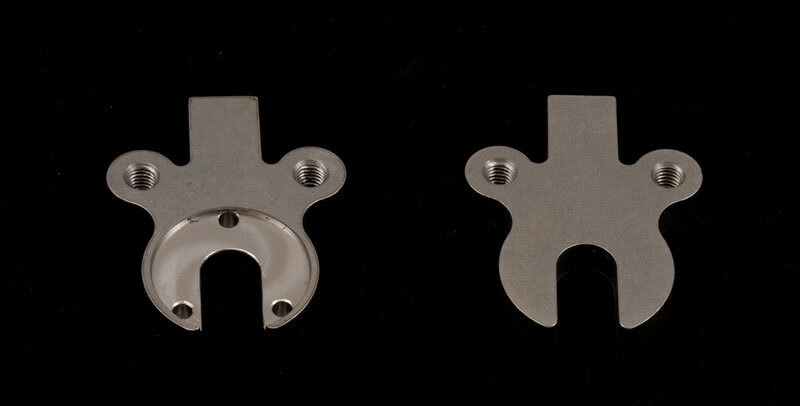 So if you use the Solder Plate (seen below) to create a left side SL dropout based on a typical road dropout, the 45 degree forward facing contact plate will work as a rear facing left side contact plate. The tool for pressing the contact plate, insulating plate and dropout together. The left side of the tool fits between the two dropouts in the finished fork. The right side tightens the right dropout assembly together. More builders who build frames and forks with SL dropouts, but won't build just a fork. Many more listed soon. If you're a frame builder who is currently building SL forks and I haven't listed you here, please accept my apology and let me know you want to be listed. The section below displays parts and tools for modifying existing forks. If you're building a fork with the dropouts shown above, you will not need any of the parts or tools shown below. Existing forks, if the dropouts have enough material around the axle slot, can be modified to take the SL hubs. For example, if you have an older road fork with Campagnolo dropouts, forget it, unless you want to heavily modify the dropouts. You either need a new fork, or install new dropouts like the Schmidt stainless dropout pictured above, or modify the existing dropouts by adding material. I have what you need regardless of how you wish to proceed. The dropout slot needs to be about 5mm longer than the slot in the old Campagnolo dropouts. Shown here, the Campagnolo dropout isn't large enough to fit the insulating plate and contact plate. If you're going to use it, you need to do some work. 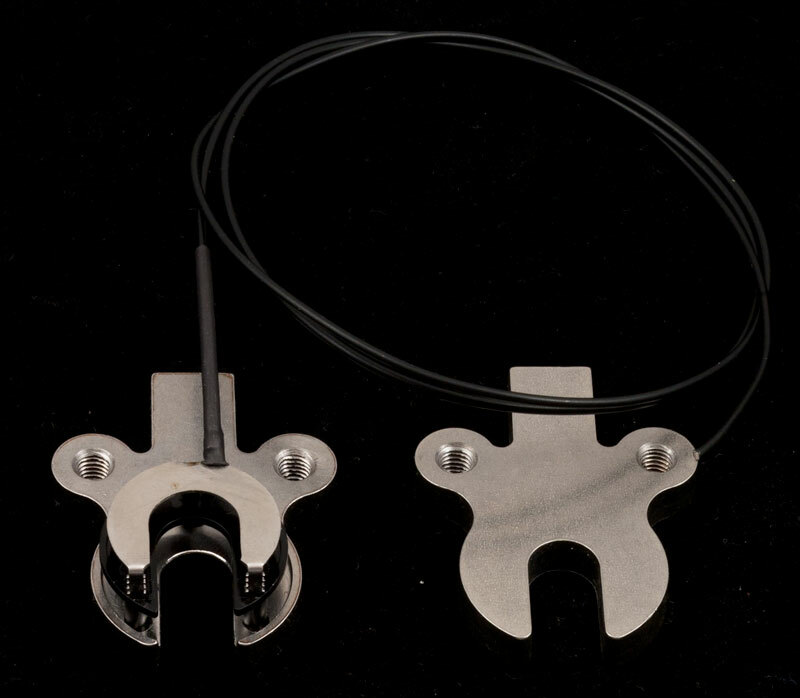 The "Solder Plate" pictured on the left, is soldered to the inside of the right dropout. Then it's slotted and drilled using the drill guide pictured below. The right dropout then has the stainless steel "Ground Contact Plate" soldered to its inside surface. You shouldn't count on the plain steel dropout surface to conduct electrical current. By using the stainless steel plate you ensure optimal conductivity. Another image with Campagnolo dropouts, typical of dropouts used on high quality traditional steel forks, and the parts needed to convert a fork. Here I've just placed the solder plate (left) and ground plate (right) onto the dropouts to show how they would be positioned for brazing. After brazing, the solder plate (here shown on the left but placed on the right fork dropout) would need to be slotted for the hub axle. Then the entire dropout would be drilled using the drill guide, shown just below. I'm showing this using loose dropouts. But this would only be done on an existing fork. Otherwise, it would be better to build a fork using Schmidt's own dropouts, as shown above. Three holes (3mm) must be drilled in the right dropout to install the insulating and contact plates. These must be precisely aligned. The drilling guide pictured here ensures correct alignment of the holes. It fits between the two dropouts. The brass guide (shown here held in place by a piece of inner tube) is pressed against the dropout slot. The brass piece is bevelled at the end to about 8.5mm. There's a set screw inside that you can't see in this photo. When tightened with an allen wrench, the set screw forces the brass guide into the dropout slot. The dropout is 9mm, so the guide fits nicely in the slot, and correctly positions the three holes in the end section so you can drill with confidence. Remember! You don't need this tool if you're building a fork with our dropouts. You only need this tool if you are fabricating your own dropouts. Our dropouts already have the three holes drilled. After you've drilled the three holes in the right dropout, you may need to remove some material from the inside face of the right dropout. This makes the space for the insulating plate and contact plate. This is the tool you'll need. The tool tapers to 9mm so it fits within the left dropout and can mill the right dropout. You would use this tool if you're modifying a fork that has large dropouts, like most aluminum forks. 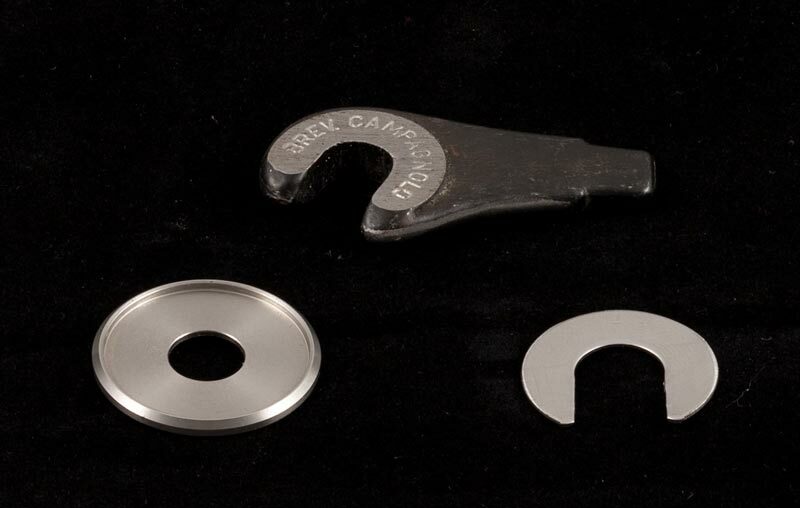 If you're modifying most steel dropouts, you'd use the solder plate shown above to create a large enough surface for the contact plate, and you'd have no need for the counterbore. Remember! You don't need this tool if you're building a fork with our dropouts. You only need this tool if you are fabricating your own dropouts. Our dropouts have already been counterbored. By the way: I am no longer a frame builder. I cannot modify forks. You will need to contact a competent frame builder to have this work done. Sorry, but for me, those days are over. When building the disc versions, since the offset to make space for the disc is so small, I find that there is no need to use different spoke lengths on the right side vs the left side. Use the same spokes all around, and you'll only have to make a small adjustment to center the rim. All wheelbuilding stands I'm familiar with are made of steel or aluminum, and all conduct electricity. When building the wheel with the SL hub, you must electrically isolate the right end cap of the hub axle from the truing stand. Electrical tape works well. If you wish, radial spoking is allowed, though not on the disc versions. It is critical the the SL hubs be used in the correct alignment. The right dropout actually has both sides of the electrical circuit. And the right axle end has both sides as well. And that's the key. The inside surface of the right dropout is electrically isolated from the rest of the dropout. And the right side of the hub axle has two sections; power and ground, which contact two sections of the right dropout. If you install the hub backwards in the fork, you'll short the circuit and your lights will not work. If that happens reverse the wheel. When you hold the wheel or hub in your hand and turn the axle, you'll feel a lot of resistance. There are 26 poles and 26 magnets in the SON28 hub (fewer in the SON20). That creates 26 points around the hub shell that the axle wants to settle in, and a corresponding 26 points where the axle doesn't want to be. In the transitions between those points, the axle wants to turn in one direction or the other, to find the point where it wants to settle. As you ride, the hub turns relative to the axle, and 26 times in each rotation of the wheel, the hub wants to turn one way, and then the other, theoretically speeding you up and slowing you down, 26 times per rotation. At speed, the effects of these two forces almost completely cancel each other out, leaving you with extremely low drag overall. It's only when you don't have a lot of mass (your weight) and inertia (your speed) that the effect is to actually retard the rotation of the hub axle. So there's no reason to be concerned about the way the axle feels when turned by hand. The Bearings Cannot Be Adjusted! Frequently, people decide that I'm stupid, (Who can blame them?) and that in fact the notchiness they feel while turning the axle by hand is due to the bearings being adjusted too tightly. This is not the case. There is no adjustment for the bearings! They are sealed cartridge bearings, and require no adjustment. Nor is adjustment even possible. Sometimes a mechanic will use two vise grips to hold the ends of the axle. This genius doesn't stop to think why there is no obvious means of adjusting the bearings. The brilliant mechanical wizard then turns the two ends of the axle, in a vain attempt to loosen the bearings. Well, all this does is break the electrical connections inside the hub, making it useless for powering a light, though it will still work just fine as a front bicycle hub. It also voids the five year warrantee. You will have to send the hub to me for a complete rebuild, (assuming you want the lights to work again) which will set you back $ 60.00 plus return shipping, and a wheel rebuild. The point of this poignant little morality tale is quite simple. Leave the hub alone! If you bring your bike into your local shop for a tune-up, tell the mechanic to leave the hub alone! If the mechanic thinks he knows better than anyone else about how the axle on a SON hub should feel when turned, find yourself another bike mechanic. Only if you hear a scraping sound (an extremely rare condition which means there's corrosion on the dynamo core) while turning the axle does the hub require service. And neither you nor your local shop will be able to perform that service. The SONdelux SL Disc (the disc version) absolutely should not be used on a fork without a retention ridge (also called "Lawyer Lip") on each dropout. 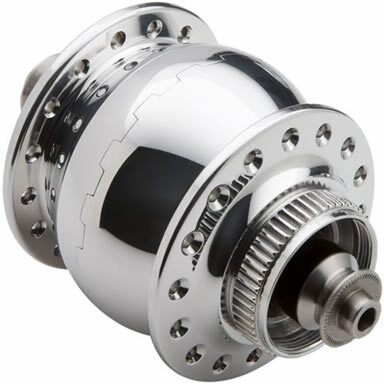 Torque from the disc brake can cause the hub to work its way out of a standard (flat) dropout during hard braking! This is a severe safety hazard! This is not unique to the disc version of the SON. It is true of all front disc brake hubs, not just dynohubs. Any front disc hub, whether made by Schmidt, Phil Wood, Shimano, White Industries, or whatever, must only be used with dropouts having an axle retention system. If you can remove your current front wheel by simply flipping open the quick release and letting the wheel fall out, you must not use any front disc brake on your bike! This is not an issue with the standard (non disc brake) SONdelux SL hub. Do You Like to Tinker? I'm a bicycle mechanic, who happens to import some very nice bicycle lights from Germany. I frequently get phone calls or email from people who want to try a different way of connecting their lights, often through the use of their own switch box, and they want my advice. Others want to use the output of the Schmidt hub for recharging the batteries of cell phones, Palm computers, hair dryers or Uranium PU36 Explosive Space Modulators. While I like Uranium PU36 Explosive Space Modulators as much as the next guy, I have no advice to give regarding powering one from the Schmidt. I only support using the Schmidt hub with the lights I sell, and with the wiring pattern I recommend. If you would like to try something different, be my guest. I wish you all the best, and I'm happy to sell you a hub, but you're on your own. Well, I'm still just a lowly bike mechanic. But Busch & Müller, PedalPower+ and Tout Terrain now all make chargers for battery powered "Gizmos" that people festoon all over their handlebars. These chargers take the output of the SON and will charge your "Gizmo", like a cell phone, GPS, PDA, or Uranium PU36 Explosive Space Modulator while you ride. More details as they come in. We have lots of headlights that work with the SON. The main headlight page is here. More info is on the Inoled page. Info about some headlight beams is here. But these issues need not be a problem. Wire connectors are readily available that can be used in-line, so that when you remove your rack, you quickly disconnect the wire right along with it. You can get them from Radio Shack. And we have some high quality gold plated connectors from Supernova. Unbolting a rack is a lot more work than disconnecting an electrical connector that's designed for that purpose. And by using dynamo powered taillights, you reduce the need for batteries, the expense of buying new ones, and the hassle of being sure rechargeables are properly charged. Battery taillights are great for backing up dynamo taillights, in the rare case of a wire failure or circuit failure inside the light itself.